Mounting Bar for Aluminum Hanging Address Sign - - for arch shape, oval shape, and rectangle shape two side hanging plaques. Bar only. Post not included. Black ladder rest bar with pre-drilled holes for the matching signs. Bar can be installed on a tree, post, or wall. Dimensions: 19.375" x 4.75" x 3.125". 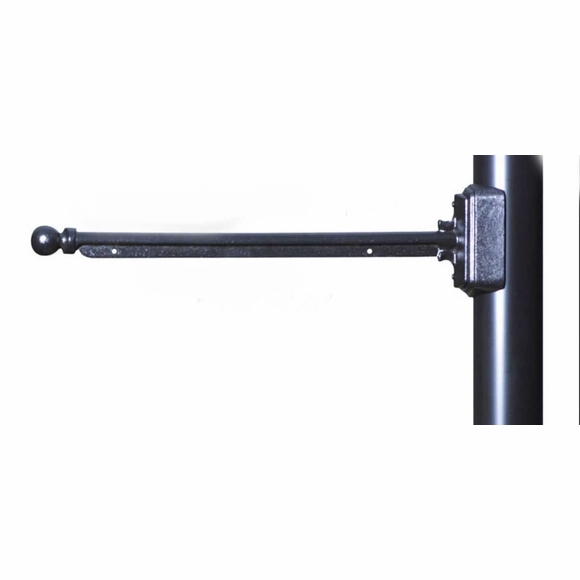 Two styles: with a flat mount adapter or round post adapter. Post photo with 88 Biltmore address sign accompanied the below review from Andrew Tusa. Thank you for submitting your photo! Classic look. We mounted to a square cedar post. Note...it does not come with screws. I am so glad that I ordered the Mounting Bar to go with my double sided address plaque. I was ready to hang it immediately. I did not have to go shopping all over town to find something to work. And the quality couldn't have been better. Super pleased that I purchased it. Easy to install, very sturdy and looks great.